The most barren regions of the universe are the far-flung corners of intergalactic space. In these vast expanses between the galaxies there is just one solitary atom per cubic meter — a diffuse haze of hydrogen gas left over from the Big Bang. On the largest scales, this diffuse material is arranged in a vast network of filamentary structures known as the “cosmic web,” its tangled strands spanning billions of light years and accounting for the majority of atoms in the universe. Now, a team of astronomers has made the first measurements of small-scale ripples in this primeval hydrogen gas. Although the regions of cosmic web they studied lie nearly 11 billion light years away, they were able to measure variations in its structure on scales 100,000 times smaller, comparable to the size of a single galaxy. The results appear in the journal Science. Intergalactic gas is so tenuous that it emits no light of its own. Instead, astronomers study it indirectly by observing how it selectively absorbs the light coming from faraway sources known as quasars. Quasars constitute a brief hyper luminous phase of the galactic life-cycle powered by the infall of matter onto a galaxy’s central supermassive black hole. Quasars act like cosmic lighthouses — bright, distant beacons that allow astronomers to study intergalactic atoms residing between the location of the quasar and the Earth. But because these hyper luminous episodes last only a tiny fraction of a galaxy’s lifetime, quasars are correspondingly rare on the sky and are typically separated by hundreds of millions of light years from each other. 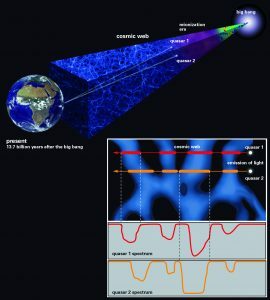 In order to probe the cosmic web on much smaller length scales, the astronomers exploited a fortuitous cosmic coincidence: They identified exceedingly rare pairs of quasars right next to each other on the sky and measured subtle differences in the absorption of intergalactic atoms measured along the two sight lines. “Pairs of quasars are like needles in a haystack. In order to find them we combed through images of billions of celestial objects, millions of times fainter than what the naked eye can see,” explains Joseph Hennawi, an associate professor at University of California Santa Barbara’s Department of Physics. Hennawi pioneered the application of algorithms from ‘machine learning’, a branch of artificial intelligence, to efficiently locate quasar pairs in the massive amounts of data produced by digital imaging surveys of the night sky. Once identified, the quasar pairs were observed with the largest telescopes in the world, including the 10-meter telescopes at the W. M. Keck Observatory on Maunakea, Hawaii. The University of California (UC) is a founding partner of Keck Observatory, and UC astronomers have access to its telescopes. The discovery team gathered a majority of the data using the Low Resolution Imaging Spectrometer (LRIS), a faint-light instrument on the Keck I telescope capable of taking spectra and images of the most distant known objects in the universe, along with the Echellette Spectrograph and Imager (ESI) on Keck II to capture high-resolution spectra of the rare double quasars. “One of the biggest challenges was developing the mathematical and statistical tools to quantify the tiny differences we measured in this new kind of data,” said lead author Alberto Rorai, Hennawi’s former PhD student, who is now a postdoctoral researcher at Cambridge University. Rorai developed these tools as part of the research for his doctoral degree, and applied them to spectra of quasars obtained with Hennawi and other colleagues. 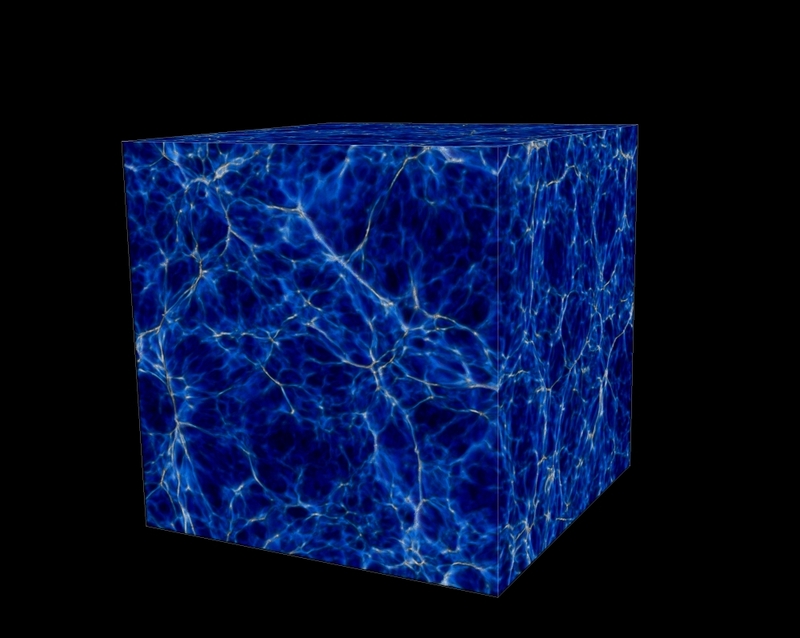 The astronomers compared their measurements to supercomputer models that simulate the formation of cosmic structures from the Big Bang to the present. On a single laptop, these complex calculations would have required almost 1,000 years to complete, but modern supercomputers enabled the researchers to carry them out in just a few weeks. 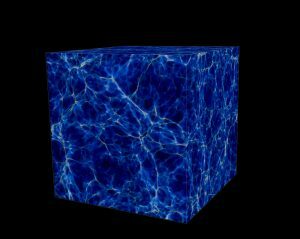 “One reason these small-scale fluctuations are so interesting is that they encode information about the temperature of gas in the cosmic web just a few billion years after the Big Bang,” explained Hennawi. Astronomers believe that the matter in the universe went through phase transitions billions of years ago, which dramatically changed its temperature. These phase transitions, known as cosmic re-ionization, occurred when the collective ultraviolet glow of all stars and quasars in the universe became intense enough to strip electrons off atoms in intergalactic space. 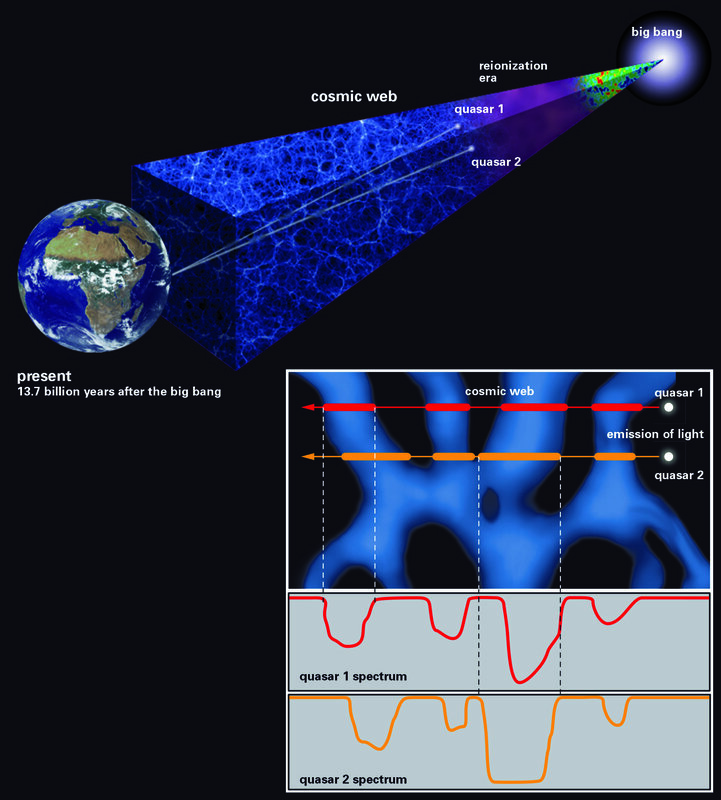 How and when re-ionization occurred is one of the biggest open questions in the field of cosmology, and these new measurements provide important clues that will help narrate this chapter of the history of the universe.